We want to take this opportunity to thank all the folks who have generously donated to the site over the past year. (Please, if you’ve donated and are a Forum member, tell us your Forum “nickname” so we can acknowledge your contribution). This year we received roughly 225 donations, many from “repeat” contributors. Thank you all! We also want to thank the many individuals who help this site by donating time and effort and/or writing articles. This includes Kelly Bachand, Charles Ballard, Jason Baney, Vince Bottomley, John Brewer, Mike Bryant, Brand Cole, Richard Franklin, Speedy Gonzales, “Graymist”, Sam Hall, Dan Lilja, Bryan Litz, Chris (“Techshooter”) Long, Larry Medler, Danny Reever, German Salazar, Russell Simmonds, and members of the USAMU. We also want to acknowledge the dozens of fine shooters who have helped us with the Guns of the Week features. They have spent much time and effort to bring you their stories and photos. And we want to say thanks to our commercial sponsors that have supported the site this year through advertising or donated items for auction. Last but definitely not least we should all thank the field testers who have volunteered reloading and range time to test loads and products: Jason Baney, Barry Bluhm, Joe Friedrich, Mark LaFevers, German Salazar, and Jerry Tierney. 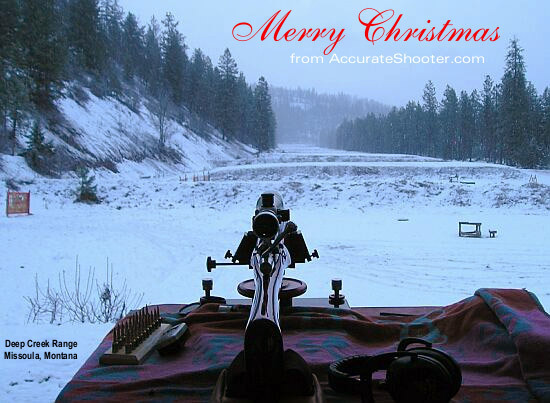 Share the post "Happy Holidays to our Readers Around the World"
Sam Hall of Boonville, North Carolina is “King of the Hill” when it comes to the 600-yard benchrest game. 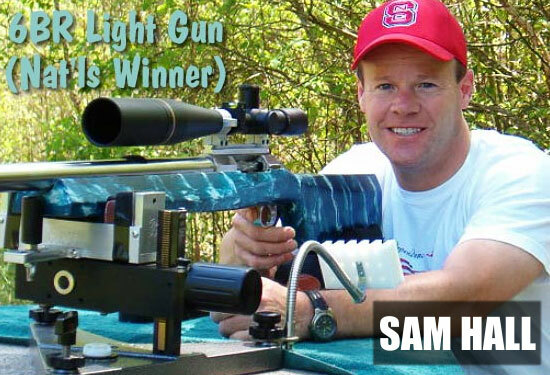 He is the 2009 IBS 600-yard Shooter of the Year, and he won the IBS 600-yard Nationals two years in a row. When Sam talks, people listen… if they’re smart. 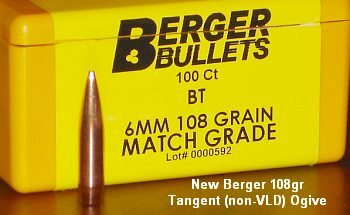 Sam was recently asked to compare the performance of Berger’s 6mm 108gr boattail vs. Berger’s 105gr VLD bullet. As Sam explains, both bullets have the potential to shoot really well, so your barrel and the conditions may dictate which projectile works best. I shot the 108gr Bergers (and 108 BT BIBs for a few matches) all last year in my Light Gun (LG) and Heavy Gun (HG) in 600-yard IBS competition, but switched to Berger VLDs during the Nationals because of the extreme winds in South Dakota. When I started loading for the 108s, I quickly learned they are much easier to tune than VLDs. In the two barrels in which I shot the 108s, they did not seem to be sensitive to seating depth or powder charge like the 105 VLDs. I could not see much difference in groups at 600 yards during tuning. But, with the 108s, you will need to drop about one grain in powder compared to the VLDs due to longer bearing surface and extra weight. It seemed that the 108s show a consistent round-pattern group, where the VLDs many times have flyers. By this I mean, if both the 108s and 105 VLDs shoot a two-inch, 5-shot group at 600, the 108s will be evenly distributed in the two-inch circle. Conversely, the time the VLD’s will often have 3 or 4 shots in one inch but 1 or 2 flyers expanding the group to two inches. But when the VLDs don’t have a flyer, look out! That’s when most of the World Records have been set and VLD shooters have come from behind and won the match. (Yes, I am talking to you Mike Davis). Mike Davis and I talked about the Berger 108s vs. 105s last year. The 108gr BTs are great until the wind gets up. They seem to get blown around more than the VLDs. A half-inch extra at 600 yards these days means the difference between winning or ending up middle of the pack. So, ideally, a shooter would have two loads. One would use the 108s for mild days, and the second would use the 105gr VLDs for those windy days. If you don’t have time to tune the 105gr VLDs (tuning them can be difficult and time-consuming), I suggest you stick to the 108s. They will save you a lot of headaches and will stick close to the VLDs in most conditions. I almost forgot to mention. As the temperature and humidity got up in the summertime last year in North Carolina, the 108s did not perform for me as well as they did during the cooler, less humid months. I tried developing a new, hot-weather load for the 108s, but I never got the 108s to perform as well in the summer as I did in the winter and spring — even when there was no wind. I don’t know why the 108s prefer cooler, less humid conditions, except maybe because they have more drag than the 105gr VLDs. High humidity may have had more of an effect on the 108s than we’d expect from the slight BC difference between the two bullets. The VLDs seem to drill through the wind and humidity better than the 108gr Bergers. NOTE: These findings are my own opinion based on many, many groups shot tuning and in competiton, while using several barrels of various manufacturers. Share the post "600-Yard Shooter of the Year Sam Hall Compares Berger 108s and 105 VLDs"